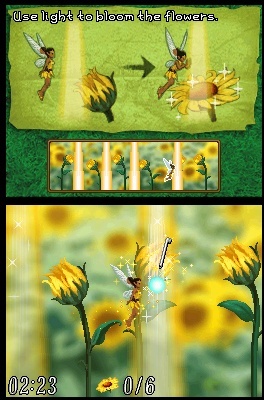 Two years ago, I played Disney Fairies: TinkerBell on the DS and actually liked it, aside from its faults, particularly with navigation. 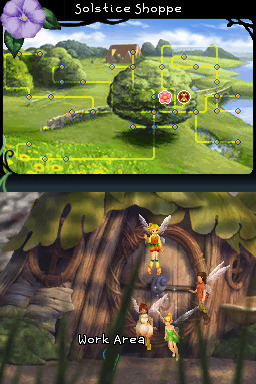 When I picked up The Great Fairy Rescue for the first time, I was happy to see that this wasn't going to be an issue anymore, and it was with great pleasure that I dedicated my time to this childish girly adventure. You begin by creating your own custom fairy. 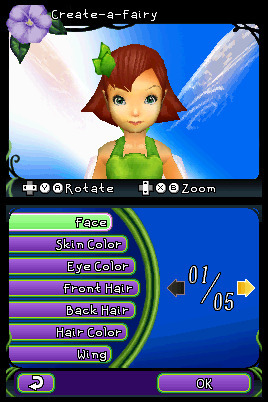 You can choose the face shape, skin tone, hair color and style and a basic outfit, as well as your fairy's talent (tinker, animal, garden, water or light). The main goal in the game is to prepare the Summer Garden for the end of season party. 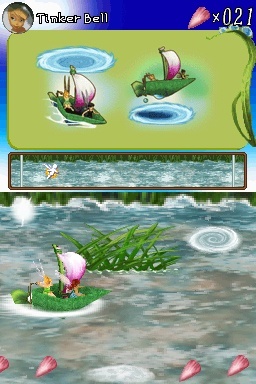 You do this by completing several tasks for other fairies in the form of fetch quests and mini-games. You will also have to search for the six lilies by looking at clues in a poem. 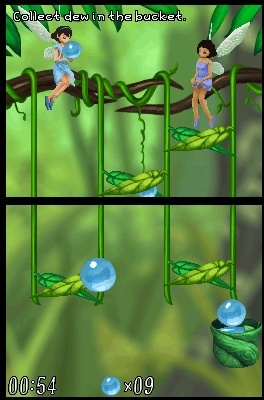 Don't worry, the other fairies will help you, so it's impossible for you to get stuck. 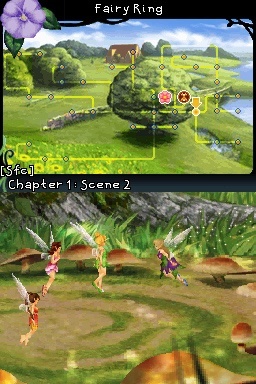 On the top screen, you will see a map of the Fairy Camp, displaying connecting areas, your location, and a mark of where you need to go next. 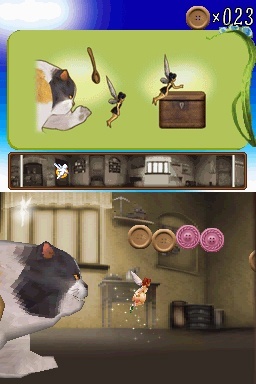 To move around, you simply need to tap the screen and your fairy will move there. Tap a closer spot and she will move normally, tap further away or drag the stylus fast across the screen, and she will zoom at a higher speed. As before, arrows will indicate a spot where you can cross to the next zone. A red arrow is your indicator for where to go next to advance the story. I was very happy to see each arrow (while before some used to blend in with the scenery) and that all of them showed the name of the area they lead to. No more aimless wandering! Quest characters will have an exclamation mark above their heads, but if you stop to talk to others, they will remind you of what you need to do next. 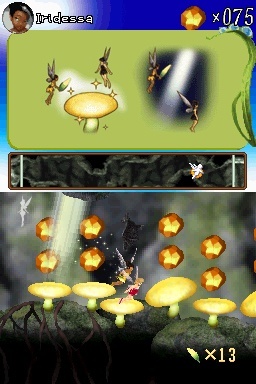 As far as mini-games, there are about 30 to be discovered. 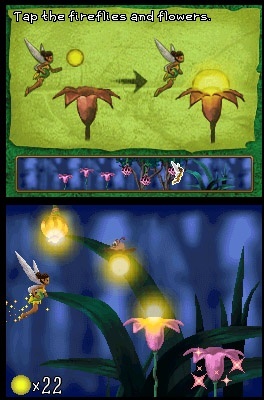 Many of them MUST be completed so that you can advance the story, and some of them are a little challenging, since your fairy can only be hit 3 times (or hit 3 obstacles) before you're forced to restart. There is no difficulty adjustment either for these, and maybe younger gamers could have used that feature. Most of these are side-scrolling games where you must reach a goal. The top screen shows your progress and how far you are to reaching the end, except in the maze game, where you really don't know where you are, but know you must keep progressing to the right. 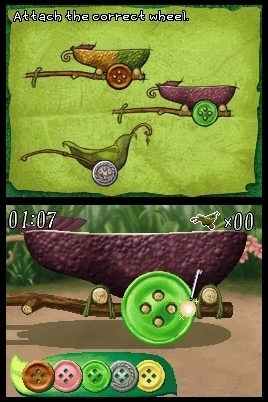 Other side-scrolling mini-adventures include escaping Lizzy's cat while dodging falling spoons, racing against a dragonfly, rafting down a river on a leaf boat and moving dew drops around to lift of lower leaves so that you can find your way through a grassy maze. Other tasks include frosting and decorating cookies, icing a cake, repairing broken items, sewing and tending to the flowers in the Summer Garden so they bloom. All of the easier tasks revolve around color and shape recognition, which makes them fun and educational. Sadly, these don't become available in the mini-games menu once you complete them. 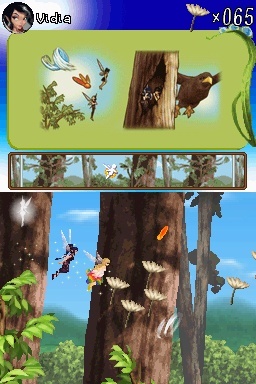 Some of the games are accessible right away from the main menu, including a WI-FI multiplayer game. 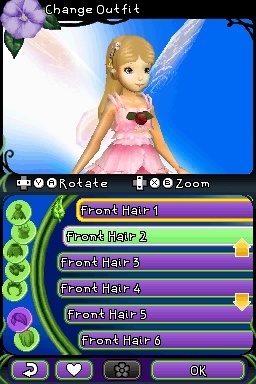 Playing these non-story mini-games awards you with materials which you can use to create new outfits for your fairy while in story mode. And laugh at me if you will, I actually enjoyed creating all the cute flower and leaf dresses just to see what they looked like! 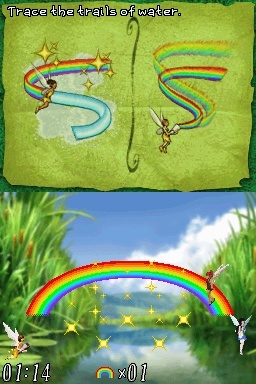 You can also find other materials and flower seeds by exploring Fairy Camp, but they won't be as easy to get. By flying around, you will find little colourful spots where something is hidden, but sometimes they are easy to miss when you're flying too fast. However, there will be a distinct noise that eventually you will get used to, which is your hint to stop and look for the little colourful water drop shaped icon. 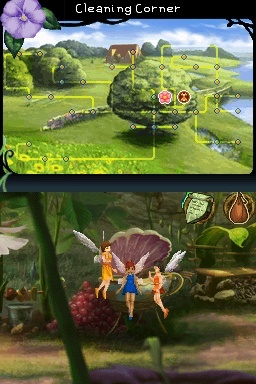 There is definitely plenty to do and many magical things to discover in Fairy Camp, including all the added D-Gamer awards and unlockable goodies. 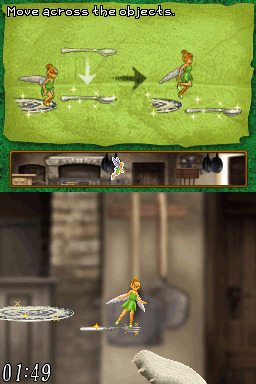 I'm sure little girls everywhere wouldn't mind a bit of pixie dust on their DS systems. I know I didn't! Special thanks to Joseph Cariati and Disney Interactive for providing a copy of this title.